Caw Caw Interpretive Center is a hidden gem in the Charleston area. Located in Ravenel, SC, Caw Caw Interpretive Center is part of the Charleston County Parks network. There are approximately 6 miles of trails, a nature exhibit, educational facility, picnic shelters and restrooms available at park center. There is also one outhouse farther out in the trail system. There are 8 different trails spanning 3 areas, and they all intersect and overlap at different points. If you start at park center, you can see all that the park has to offer. The Habitat Loop is 3.6 miles and circles the entire park. You can start out in one of two directions and end up back at the park center. If you take the Habitat Loop, it overlaps some of the other trails and brings you to the three main areas of the park which are the swamp, the marsh/rice fields and the woodlands. The Swamp Sanctuary Trail is .4 miles and traces the Habitat Loop before circling back to the park center. The terrain is partially packed dirt but is primarily raised boardwalk through a cypress swamp. 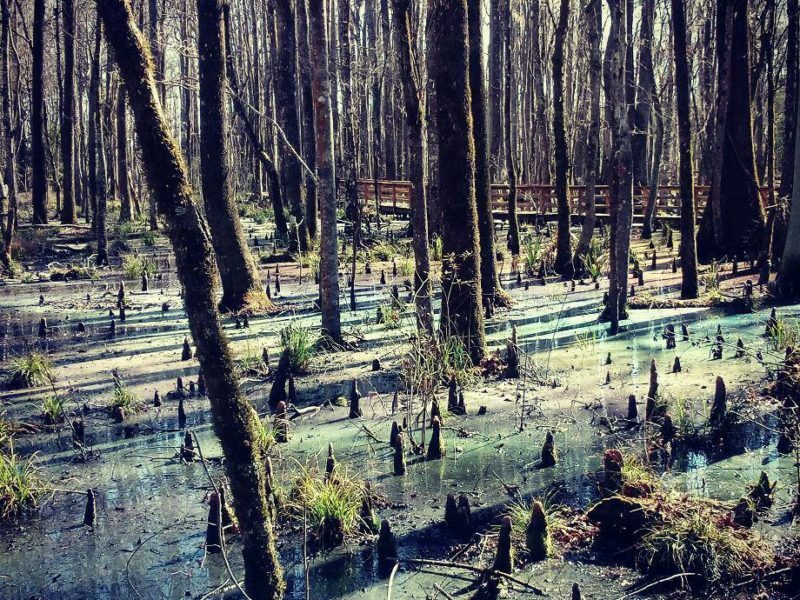 In the late winter this area is known for a phenomenon they call the “rainbow swamp” when the light catches the oils of the cypress on the swamp water at the right angle and appears as a rainbow. 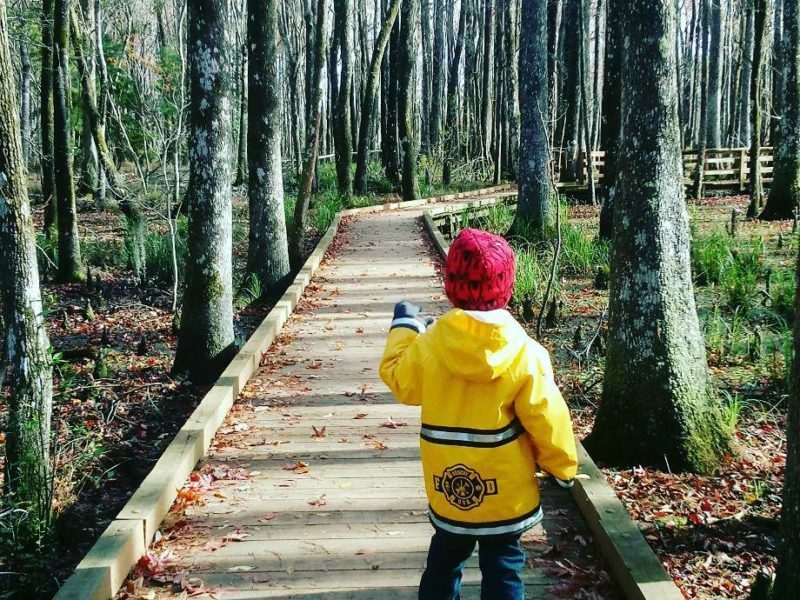 The trail is stroller friendly but some of the boardwalks do not have railings. If you follow the Swamp Sanctuary Trail you will have the option to continue on the Habitat Loop to connect to the Rice Fields Trail and Waterfowl Trails or loop back to the park center on the Uplands Forrest Loop. The outhouse is just beyond the boardwalk where the trails intersect. The Uplands Forrest loop connects to all of the outer trails and features educational historical placards and an outhouse. The Rice Fields Trail brings you between the old rice fields and the brackish marsh. The Waterfowl Loop will take you across a small bridge and around the outer loop of the brackish marsh. Either of these trails are a great opportunity to view wild life. 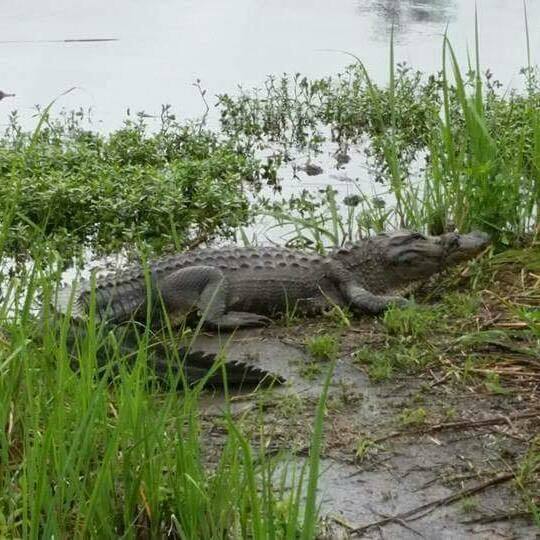 There is an alligator population in this area so it is important to stay to the center of the trail away from the tall grasses of the marsh & rice fields as this is where the alligators nest and sun themselves. Snakes are also common in this area. Both of these trails eventually intersect with the Marshland Trail which connects to the Martime Forrest Trail which you can take to the Bottomland Forrest Trail or as a shorter loop back to the park center. The Waterfowl Trail and Bottomland Forrest Trail trace the Habitat Loop. 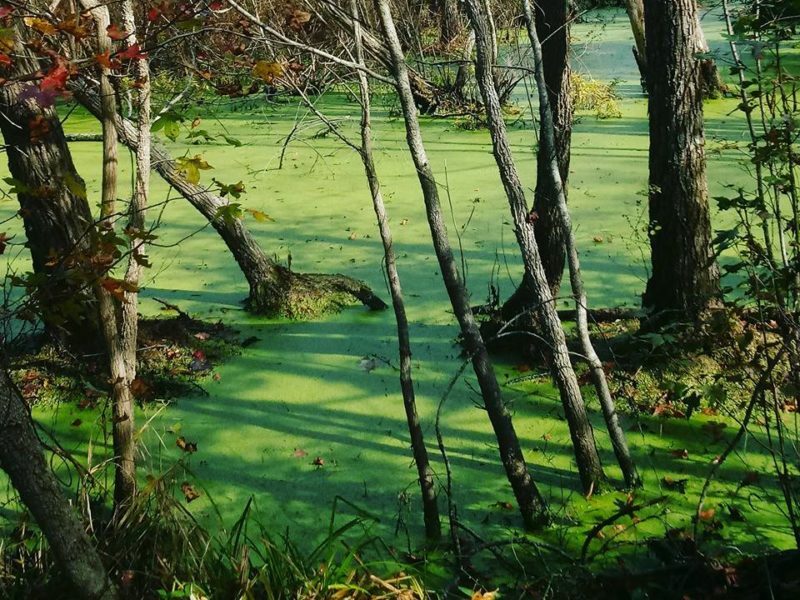 The Bottomland Forrest Trail is a 1.4 mile loop that takes you through the more wooded trails. The terrain is packed dirt, mulch, rock and gravel. This trail tends to flood out with heavy rain so check with the park center before heading out to see if any trails are closed due to flooding. The Bottomland Forrest Trail is a great place to spot deer, wild turkey and woodpeckers. The Bottomland Forrest trail overlaps the Habitat Loop for one mile and then circles around back to park center. My favorite path to walk is to start on the Swamp Sanctuary Trail and continue on to the Waterfowl Trail, connect to the Marshland Trail and loop back to park center. That path is just over two miles. It can be shortened by substituting the Rice Fields Trail for the Waterfowl trail and still take you through the three main view points (Swamp, Marsh, Woodlands). Habitat Loop- Circles entire 3.6 mile loop visiting the swamp, marsh and woodlands. Overlaps parts of the Swamp Sanctuary, Rice Fields Trail, Waterfowl Trail, Marshland Trail, Martime Forrest Trail and Bottom Woodlands Trail. Swamp Sanctuary Trail- Cypress Swamp with boardwalks. Connects to three other trails or loops back. Rice Fields Trail- Shorter of the two rice field/brackish marsh loops. Great place to view wildlife, alligators and waterfowl. Features a view point and rest area with benches. Waterfowl Trail- Longer of the two marsh trails. Great place to view wildlife, alligators and waterfowl. Traces part of the Rice Fields Trail and then reconnects to the Marshland trail. This trail is the outermost point of the Habitat Loop. Upper woodlands trail- Small wooded loop nearest park center. Connects other trails. Features educational markers and outhouse. Marshland Trail- Connects Rice Fields Trail with park center and Bottom Woodlands trail. Martime Forrest Trail- Traces the Tidal Marsh and connects the Marshland Trail with the Bottom Woodlands Trail. It is a great place to see wildlife. Bottom Woodlands Trail- This is one of the less traveled and rustic trails. It is a great place for birding and for deer sightings. Parking lot at Interpretive Center. $2 per person age 3 and up. 2 and under and pass holders are free. Nicholl Summers currently lives in Charleston, SC but has lived all over the country from Alaska to Puerto Rico and many places in between. Whether it is hiking a mountain, walking a beach, exploring a swamp or checking out a cave, she usually has both of her littles in tow. Mom of two boys age 4 & 1, how their family hikes has evolved over the years, but no matter where they go, they love to connect with nature. Caw caw recurring kid lead hike.